- LoiLoScope2.5 supports the fast video output of Intel Corporation’s MSDK2012. 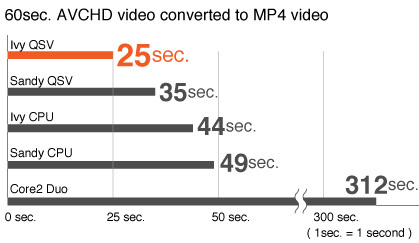 Full HD videos conversion time reduced to 60% of normal conversion time! - Record voice/ sound directly on the timeline with new Dubbing feature. - Change the selected colors on your videos and photos to change it to transparent color with the new Color Key feature. - Make videos to contribute to disaster prevention with the new Stopwatch feature. - Videos output for New iPad and PS Vita added. Focus on a new feature! With the Color Key feature, the color trimming also on your videos is easy! With the Color Key feature's color picker tool, you only need to click on the color of your videos and photos you don't want to use and it will take it out easily. LoiLoScope2.5 supports the fast video output of Intel Corporation MSDK2012! Export 1hour Full HD video in only 25mn. LoiLoScope2.5 supports the MSDK 2012 provided by Intel Corporation and can output videos faster with the Intel Quick Sync Video. Because of this technology, complete export time of Full HD videos with 60% less time. Use this feature to reduce significantly the Blu-Ray and DVD creation time. 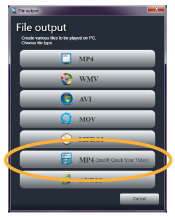 Select the "Encode with Intel Quick Sync Video" from the Output menu, output tool of the Blu-Ray/DVD, watch with external device. Warning: You can use this feature with the PC equipped with the 2nd generation or the 3rd generation of Intel Core processors family. With the PC which the Intel Quick Sync Video fast output is possible, the above logo will appear on the output menu. How fast is it now? Comparison with the so far exporting time. How fast is the exporting time now when using the 2nd and 3rd generation Intel Core processors family? We collect information on the required exporting time of 1mn HD video and summarize it on a chart. Dubbing feature added! Put narrations on your videos! While editing on the timeline, you can now record voices on your videos. The voice recorded is saved as a music file, so you can change the timing, cut or put together some parts and adjust the volume. You can edit music files as you want to do. Connect the mic on your PC. On the timeline tool menu, click on the Record button. On the left menu, choose the audio input or change, adjust the volume. When ready to record, click on the "Start" button on your preview screen. Once you finished recording, click on Pause button or click on the "end recording" button at the bottom of the playback screen. After recording, listen again with the "confirm" button and if it's fine click on the "Ok" button to save it. With the Color Key feature, the color trimming also on your videos is easy. With the Color Key feature, when editing videos, photos on timeline, you can change the background color from the original to a transparent color. With the monochromatic filming video technic (such as blue or green background), it's easy to take out a person from a video. Put several videos or photos together and you can create fun new videos. Select the video/photo timeline bar you want to trim. Click on the add effects button. On the effects menu, select the Color Key tool. 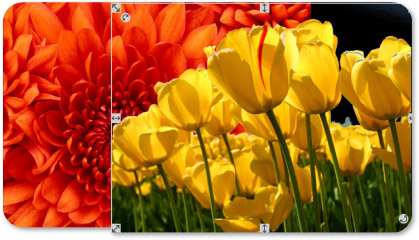 On the left, click on the color picker tool and select the portion of color you want to trim. Click on the color you want to take out with the color picker tool, you can easily trim colors of your videos and photos. Useful feature for sports or disaster prevention videos! Add a stopwatch on your videos and display the elapsed time! New Stopwatch feature is added to contribute to *disaster prevention videos or useful for sports videos. *After the Great Japan East earthquake and Tsunami, Japanese people made videos to guide to evacuation areas. You can display the time on the screen from the moment you play your videos. On the contrary, it's also possible to set up the time from the moment you want to count down. From the text menu (on your timeline tools menu), click on the Stopwatch text and place it on the timeline where you want to display it. Choose the option, count up or count down on the left, effects menu. Choose the time format to display on the screen from the type menu. Specify the time, the starting time and ending time. Specify the time and display it stopped on your screen. Adjust the count speed with the speed bar. Change the speed by moving on the left or on the right. Videos output for New iPad and PS Vita are possible now! You can now output videos to new iPad and PS Vita with optimum resolution. We've added to the output menu, "Watch on portable device". - Usability of the touchscreen has been improved. - A problem that caused an error in some environments while writing to a DVD has been fixed. - The .NET Framework installation guide for Windows 8 has been improved. - The timeline’s radar display has been improved. - A problem that prevented thumbnail images from appearing in some environments on 64-bit operating systems has been fixed. - Vimeo is dropped due to Vimeo's specification changes. - Fixed the problem being unable to display an edit screen where an NVIDIA card is used; the screen is black and only with a sound. - DVD/Blu-ray I/O libraries were updated. - Every movies in the DVD/Blu-ray creation tool end up with chapters regardless with the length. - Fixed a no-response problem which happens after PC was recovered from Sleep.